The solar energy sector continues to add significantly higher new capacity when compared with other renewable sources as also the conventional power segments. During the nine-month period ended December 31, the renewable energy sector has added 5,002 MW of new capacity, of which the solar segment alone accounted for 3,560 MW (including 3,270 MW from ground-mounted projects and 290 MW from rooftop segment). The renewable energy sector added 5,602 MW of new capacity in the same period of the previous fiscal. The new capacity addition in the wind power sector was 993 MW, which was significantly higher when compared with 569 MW in the year-ago period. Biomass (bagasse cogeneration), biomass (non-bagasse/captive power) and small hydro added 375 MW, 50 MW, and 32 MW respectively, according to the data provided by the Ministry of New and Renewable Energy (MNRE). In the conventional sector, thermal power category added 2,130 MW of new capacity during the April-December period, while hydro segment added just 140 MW. The new capacity addition of 5,002 MW in the renewable sector is about a third of the target set for this fiscal. MNRE has fixed a total capacity addition target of 15,602 MW for 2018-19. In this, solar power is expected to add 11,000 MW, while wind has been given a target of 4,000 MW. A recent official statement pointed out that projects worth 46.75 GW capacity have been bid out/under installation. The Centre has declared the trajectory of bidding 60 GW capacity of solar energy and 20 GW capacity of wind energy till March 31, 2020. 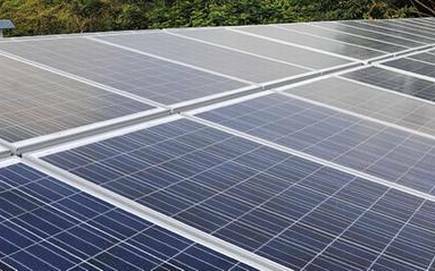 Projects worth 30 GW solar power and 10 GW wind power capacity would be bid out each in the year 2018-19 and 2019-20. As of December 31, the total installed power capacity in the renewable energy sector stood at 74,786 MW. Wind power still accounts for a major portion with a capacity of 35,138 MW. Solar was in the second position with a total capacity of 25,212 MW, which includes 23,858 MW of ground-mounted and 1,354 MW of rooftop capacity. Biomass (all included) had a total capacity of 9,780 MW. Small hydro and waste-to-power accounted for 4,517 MW and 138 MW respectively. In addition to the above, the off-grid segment, which plays an important role from the point of view of increasing access to electricity, added 137 MW during the first three-quarters of this fiscal. Cumulative capacity in this segment stood at 1,144 MW (which includes 804 MW of SPV systems, 163 MW from biomass gasifiers and 177 MW from waste to energy projects).